These days, it seems, there’s a lack of faith that trails every conversation betwixt parishioners and non-believers alike. Seldom too, at that, is there every any art that can exist as a link between them. And if some such act were produced, ‘tisn’t very well accepted that it should be any good. Well, don’t always listen to what hear. Such a landscape of beliefs can in fact, exist and does with Sean Hayes in “An ACT of GOD”. 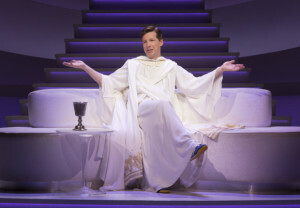 Sean Hayes carries the funny and sometimes taboo An Act of God. The one man show (with very minute supporting characters peppering the already outrageous scenes) is a menegerie of various subjects both subjective and controversial within the perimeters of the Christian persuasion. Written in devastatingly hilarious prose, and acted to absolute perfection by Hayes, the show comes as close to art as a piece of art can get, considering it’s tied directly to the Bible, with inclinations to the Liberal point of views. It’s a style that would be expected by todays standards, yet simultaneously breaks a bold new wave in terms of the dynamics of narrative and structure. Such an intriguing idea, well placed in the Los Angeles theater rounds (God knows what the New York performances were like!) audiences should find this a satisfying and rewarding treat, something everyone can laugh at, even Christians. A delicate matter to approach and even more difficult to pull off, Hayes, director Joe Mantello, and writer David Javerbaum come through for audiences, noting the problems we face as a country embroiled in religious altercation, and social doubt, while offering a viable solution as to what light should be shed on it, and how it should be taken. Act of God is playing at the Ahmason Theatre until March 13.